Closed since 2010, Lyon’s oldest hospital building located near Place Bellecour will once again welcome the public. But hospital rooms and surgical units have given way to shops and restaurants, with the hotel and Cité de la gastronomie soon to follow. The Lyonnais will finally be able to re-enter the “god hotel.” Hotel Dieu, an emblematic building of the Presqu’ ile, a former hospital closed since 2010 and under construction for five years, will open its doors on Friday, April 27. The building is one of the Presqu’ile’s historic landmarks. 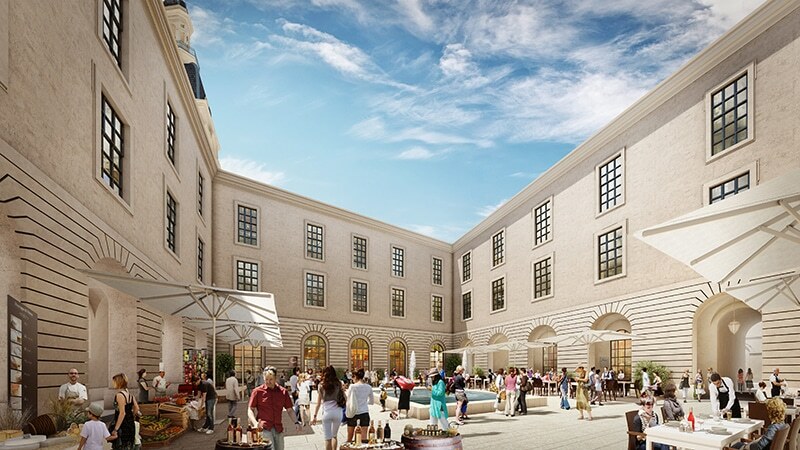 Visitors will be able to discover the courtyards and gardens of the Hôtel Dieu, along with its terraces, bars, restaurants, and the twenty or so shops located at the corner of Rue de la Barre and Rue Bellecordière, behind the building. “We’ll have a grand inauguration with a big festival that will last until 21 June, with thematic weeks on cinema and gastronomy,” says Hélène Couderc, regional director of Scaprim, the company responsible for marketing the Grand Hotel Dieu, as it is now called. 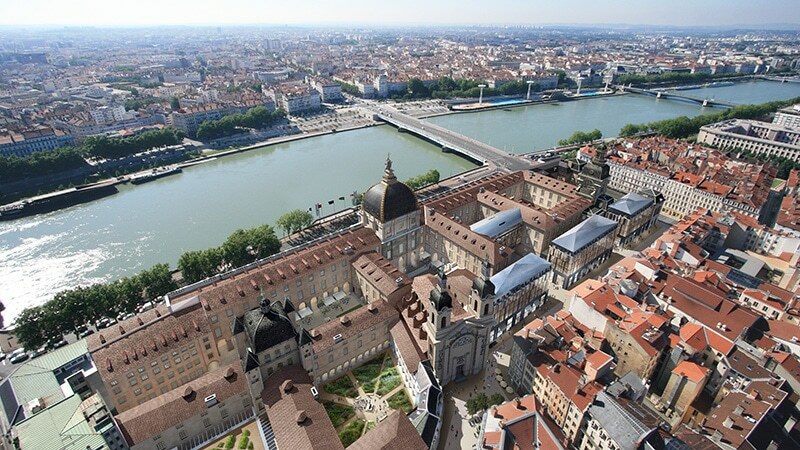 Built on the banks of the Rhône from 1184 onwards, the Hôtel Dieu de Lyon became one of the most important hospitals in France in the 15th and 16th century. Its current architecture dates back to the 18th century. Many Lyonnais were born in the maternity ward of the Hôtel Dieu until the closure in 2010. By the end of 2018 the Hôtel Dieu will host a five-star Intercontinental hotel with 143 rooms, a Cité de la Gastronomie, and offices. 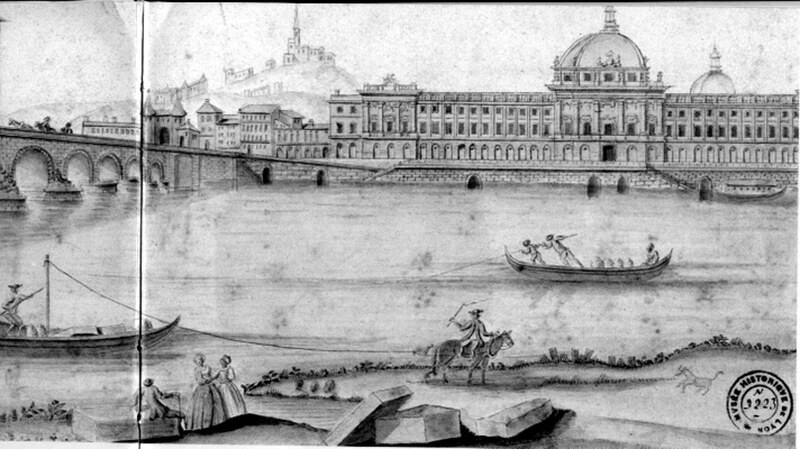 Lyon’s Hotel Dieu in the 18th century.